Davis Longboarding Association - Davis, Calif. Thanks for visiting the website of the Davis Longboarding Association. Founded in October of 2000, our goal is to assert a solid longboard presence in the city of Davis and especially on campus. Davis' population of about 50,000 is mostly comprised of college students and the main mode of transportation is the bicycle (which is also the town's logo). Slowly more and more people are differentiating themselves by skating. Being mostly flat and smooth, the city is a pushfest. So get on a longboard today. Let's welcome a valuable new member to the DLA, David Kincaid. Just in time for the rainy season, he's supplied an extensive review of Xtreme Wheelz' 112mm offroad wheel kit. Check it out here! Are we alone yet? 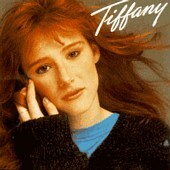 Today former teen sensation Tiffany came to UCD for a comeback show. How does this relate to longboarding? 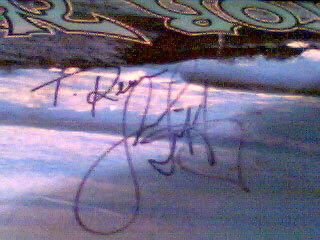 Yes that's right, I'm in possession of a longboard autographed by Tiffany. It reads: T. Kevin, Tiffany. I think I'm in love dude! Happy December! There's been a lack of updates lately, but Jennie's cut up lots more flyers so there'll be a second wave of members. Or something. While Christmas shopping, I found this. 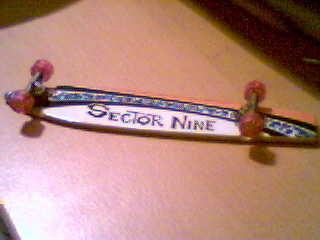 Yeah, it's a finger longboard. My immediate reaction was disgust. Then, I bought it. Welcome new member Zach! Slowly the numbers rise! Muahah.. In case you haven't noticed, it rains. If you insist on skating, a can of Silicone lubricant from Ace Hardware does the trick to protect your bearings. See ya out there suckas! The gallery has been updated a little. Have fun at Aggie Jam V... while I suffer in the lab! Yak Bearings + Breaking In > Swiss Bones! Welcome new members: Keith, Ben, Jennie... profiles to come later! Look out for the new flyers! Feel honored to be chased down by one of us and have this shoved in your face! Tonight it was me and Ant (#2) doing a cross Davis cruise from Cowell to W. Covell. We stopped at near where the skate park is and there's a pretty fun downhill course, about a 1 minute ride down. I'm thinking this is the ideal place to meet when we have more people in the club. We also need to hit the MU parking structure frequently, but only in large packs. If TAPS busts some skaters, at least we can make sure he busts all of us after we got to ride down! Leeman (#3) and I went for a short session today at the new center for performing arts parking structure over near the alumni center. It's not as exciting as it looks from the outside, there's only 2 slight declines. We promptly headed for the Memorial Union parking structure, which is still the best place to face death on campus. Maybe we should all meet there? Neo-punk, emo, whatever! The new Blink 182 live album rocks! Hey, I guess it's not that hard to make this an official UC Davis club. All we gotta do is have a handful (5+) members, and fill out some paperwork. Alright! Also, I'd like to extend a shout out to these people I met today: Ben, Keith, Jennie, and my roommate Sumeet! Yeah! You could probably say that I am a food fanatic. I enjoy it, as it is a a big part of all of our lives. When I put sweet succulent steak cooked medium-well to perfection into my mouth as it drips with marinade, I think to myself, "Oh how life is grand." Such is life - to have good friends and good food. When I eat at the San Jose State DC, I have but one thought, "God, may I please die?" Wear a thick assed jacket. Hang a red reflector or blinking light on the back of my backpack so I don't get railed by a car. Put makeshift fenders on my board if it's raining. 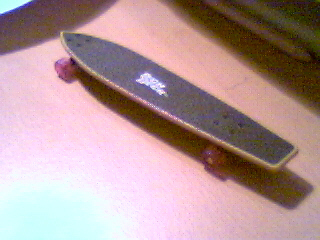 My wheels extend past the rails of the board so water gets kicked right up at me. I stick a plastic grocery bag between the bend of the truck and the deck so I don't look like i've been "Freestyle Walking" through the hog barn when I get to class. It's also a good idea to be running your crappier set of bearings in the rain. Carry paper towels if going between classes to wipe down the deck. Also to wipe down my nose.